Product #654 | SKU 0473 | 0.0 (no ratings yet) Thanks for your rating! The Sachtler FSB-6 / 2 MD Aluminium Tripod System offers stable movements to deliver the best images possible. 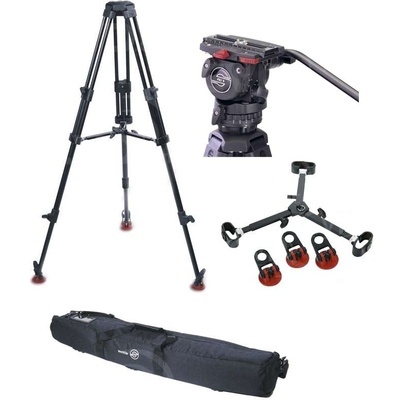 The FSB-6 system consists of the FSB-6 fluid head with Sideload S camera plate, the ENG 75/2 D two-stage aluminium tripod with mid-level spreader, and a padded case. The FSB-6 head accepts a payload up to 8 kg while using Sachtler's Snap & Go side-loading mechanism. The dynamic counterbalancing system compensates for torque as the camera tilts, preventing the camera from inadvertently tipping while ensuring that it is positioned securely at any tilt angle. Operates without any friction from -40°C to 60°C. The aluminium tripod offers very economical and strong support.